Each pot is crafted from start to finish by Francis DeFabo in his home studio. He takes the time to create pots that feel as good as they look. Bottoms of mugs are burnished to warm your hands as well as your soul. Wine and whiskey cups are carved and dimpled to excite your fingers as the contents excite your palate. Passing bowls are wheel-thrown with deep, narrow bases and organically flared rims, then squished to alter the shape, all the better for two sets of hands to share heaps of mashed potatoes, pasta, or salad. All pots are individually handmade, so the size, shape, and surface of each pot is unique. This variability is integral to the beauty of handmade ceramics. These hard-wearing pots are made to be used and enjoyed every day. The glazes are food safe, and most do just fine in the dishwasher or microwave. The designs are relaxed and subdued, like a favorite sweater. Subtle variations in each pot will reveal themselves over years of use. 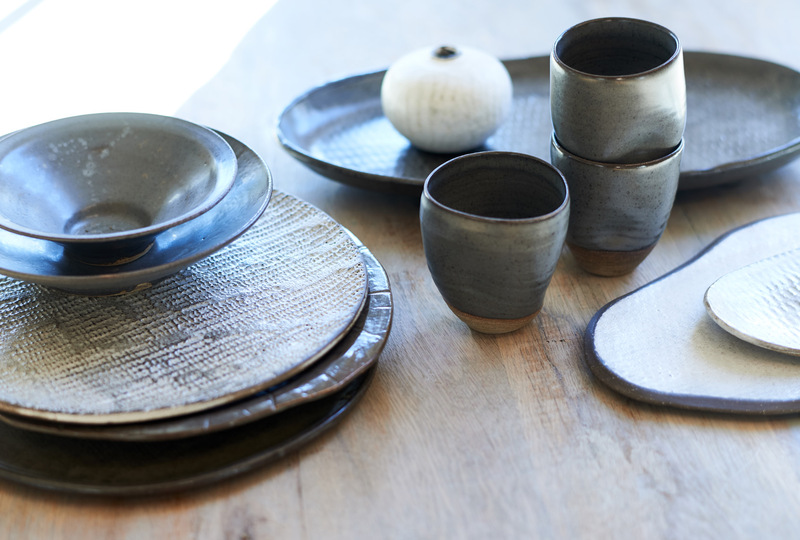 Handmade ceramics love to party with Grandma's wedding china, vintage finds, and your everyday dishes...so mix and match with gusto! Thousands of people throughout the world are sickened or die every year because they don't have access to safe drinking water. Your pottery purchase will help some of these people. 25% of all pottery sales are donated to Potters for Peace. This U.S. based non profit helps bring clean drinking water to some of our world's most impoverished people by setting up workshops that make inexpensive ceramic water filtration systems.